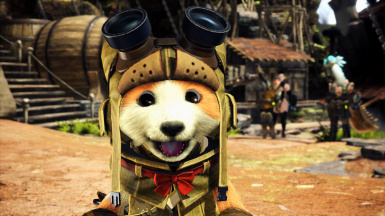 Makes your Palico look like a canine. For those who prefer dogs. Now with sounds! 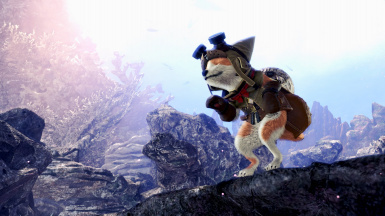 Makes your Palico look like a canine. For those who prefer dogs. Now with sounds! 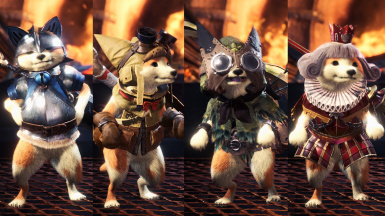 Only affects player Palicos. I decided to release this in its current state because I'm not sure if I'm going to keep working on it. 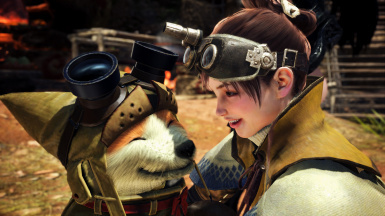 I'm not particularly a cat or dog fan, but I know some people wanted a dog partner instead of a cat, so I wanted to see if this kind of MOD is possible. 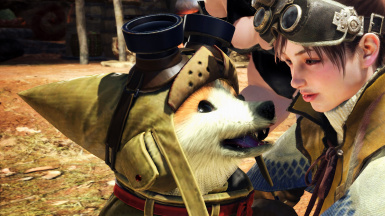 I was trying to make it look like a Shiba dog, but I think the neck needs to be a lot fatter, which causes clipping with most armor. So I reverted the neck to a thinner version. I've added dog sounds for outside of combat (talking, idling in room). The combat sounds are in other files that don't seem to be fully suppored by current available tools. So for the meantime, I've muted combat sounds entirely. 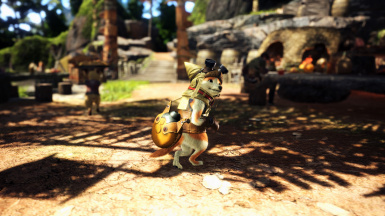 Probably goes well with this mod to remove felyne puns from Palico speech. - Some eye types look weird now (eg. too squeezed). - Fatter neck clips a little. - Eye shine should be higher, but I couldn't seem to make it go any higher. - Snout clips through some headgear. - On very rare occasion, mouth may slightly clip through the bottom of the mouth. - Sound may not apply to all voice types. I've uploaded an optional file with all the textures converted to DDS and PNG, for those who want to play around with editing them. If you don't know how to edit textures, here's my tutorial. The voices are in NativePC\sound\wwise\Windows\ and are all the files with ot000 prefix. Audio replacement can be done with this. They also have a tutorial. 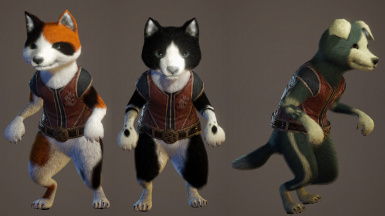 I don't know if the cutscene cat sounds are embedded into the cutscene track. Thanks to Vuze for the unpacking tools, daemon1's raw texture converter (correct offset can ungarble TEX, correct values are usually around 100 to 118), MHWTexConvert for converting DDS to BC7 and MT Framework tools by Predator for allowing me to see the UVs, and hpxro7 for MHW Audio Modding Tool. WWise tutorial from this link.